Which is why I had to share these great personalized paper fans! These paper fans are the perfect favor on your big day – you can have baskets of fans sitting near the seats at your ceremony – or even invite a couple of younger family members (or kids of friends) to pass them out to guests. The fans will keep people cool at the ceremony or your outdoor reception! 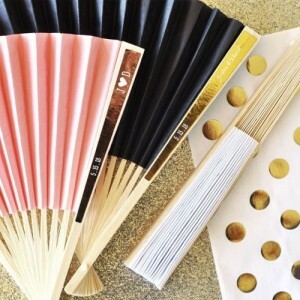 You can choose from a variety of colors for the fans – so you can match them to your wedding colors. And, you can have them personalized too. You’ll find these economical and very useful favors here.